Taurus August 2015 Horoscope forecasts that domestic and spiritual matters are dominant this month over professional matters in August 2015. August 2015 is one of the most delightful periods and it is time to enjoy the fruits of the hard work of earlier years. Planets are in excellent positions in your horoscope and things will happen effortlessly. You can indulge in your favorite hobbies to give an expression to your originality. Career takes a back seat this month in August 2015 for the Taureans, but cannot be ignored fully. This might be the right time to complete your pending projects rather than starting a new business. 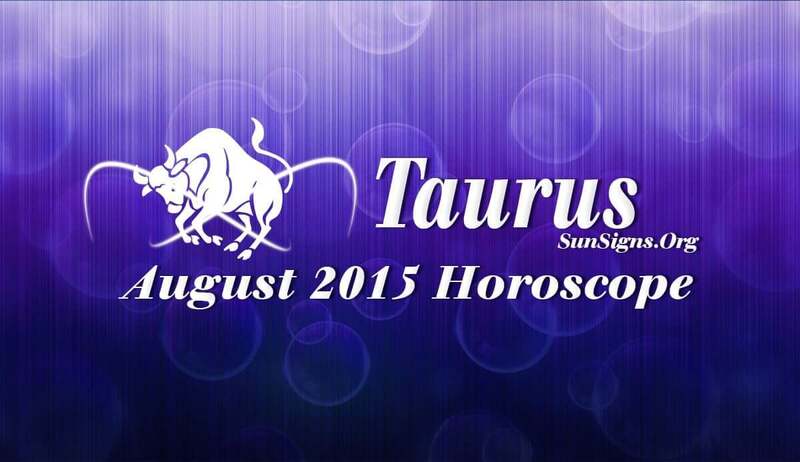 Financial fortune is mixed during August 2015 for the Taurus zodiac sign. Money will come from trading and realty with the help of family members. Conflicts with your spouse are likely over fiscal matters. The Taurus financial astrology predicts that the second half of the month is suitable for making investments or spending large amounts. Plenty of partying and celebrations with family members is forecast in August 2015 for the Taureans. Family will expand with the arrival of a child. Singles will get ample occasions to get into relationships and enjoy themselves. Existing relationships might face some compatibility problems. This is a month when good news of pregnancy to will do the rounds. It is also a good idea to go on a vacation with your spouse. The August 2015 Taurus horoscope foretells that your health will be superb with sufficient breaks and rest during the first few weeks of the month. Overall happiness in life during the month will enhance physical fitness drastically. Here are a few home remedies to overcome your hangover, thanks to your excessive partying.